Yesterday was supposed to be dedicated to getting work done that I brought home from the office, but I just couldn't resist getting my hands a little dirty. I put together this succulent dish with some plants I picked up Friday night at Home Depot -- my favorite is the furry, chocolate-colored Kalanchoe on the left. 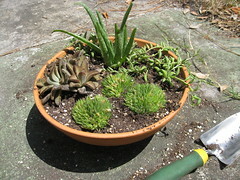 I had been wanting to create a succulent dish for some time now. I have a spot on my porch that just seemed to be screaming for one. 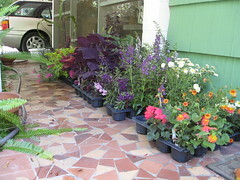 We'll see how the plants fare -- the spot may not be sunny enough for their liking. Sometimes at work we get free plants, and Friday was one of those days. I think the plants are typically leftovers from the trial garden installation or from research studies. Honestly, it doesn't matter to me. Look at all these great plants! I got to take home five flats of six-inch pots, which probably would've cost me close to $200 at a nursery. I'm planning to install them in the beds I've been renovating. 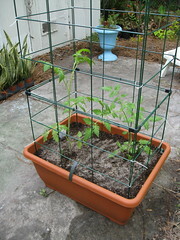 So I finally got around to planting the tomato plants that I bought at the Kanapaha Garden Festival. They're heirloom varieties called 'Hillbilly' (left) and 'Black Cherry' (right). I wanted to have one indeterminate and one determinate variety for my first tomato-growing experiment. The idea is that the indeterminate plant ('Hillbilly') will give me some big, sandwich-worthy tomatoes in the beginning of the season, though it's likely to poop out once temperatures climb. The determinate plant ('Black Cherry') should bear fruit throughout the summer that I can use on salads or in pasta dishes, quiches, or whatever. I opted to use a self-watering container that I bought from Gardener's Supply Company, with the logic that I would never remember to water the tomatoes as often as they needed water (I'm kind of bad like that). The container design is great, but the cage is another story. I cursed like a sailor while attempting to assemble it. The genius of the design is that it's several flat wire panels that can then be easily shipped. The giant flaw in the plan is that the plastic connectors that hold the wire frames together are poorly designed. You're supposed to be able to snap the frames into the connectors, which is easier said than done. I dug a number of tools out of my kit -- pliers, zip ties, and electrical tape -- but still couldn't get it together the way the instructions indicated. Grrr. I finally used the electrical tape to secure the frames to the connectors. Hopefully it will hold up to the weight of a fully loaded tomato plant. Also, I debated about putting both tomato plants in one container, since 'Hillbilly' is likely to get pretty big. We'll just have to wait and see how it goes. But boy am I anxious to have a bite of my first homegrown tomato! My backyard is currently what I call a "weedflower garden," since it's covered with tons of native spiderwort plants that put out oodles of beautiful blue flowers each morning. The yard didn't always look like this. When I first moved in, it was your standard-issue suburban back yard with a decent covering of grass. I wasn't big on watering and fertilizing, so over time the weeds (as some people call them) began to take over. 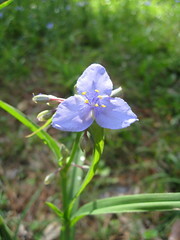 I really like the flowers produced by spiderwort, known botanically as Tradescantia virginiana, so I let them grow and bloom each spring. At least for awhile. 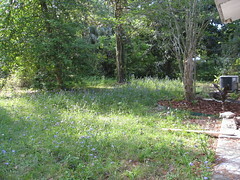 Soon I'll get serious again and mow down the "weeds," which will no doubt bring my neighbors great satisfaction. I think they believe that my backyard is a bad influence on their closely tended and well-manicured lawn. Oh well. At least I'm a good neighbor in other ways. I don't have a yippy dog, I don't throw loud parties, and I don't harass them for the invasive Chinese tallow tree that they have allowed to flourish in their front yard (although I should, especially since I'm always finding seedlings in my yard). Until I get motivated to mow, I'll continue to enjoy my weedflower garden. I like to gaze at the flowers from the kitchen door while sipping my morning coffee. I marvel at how the flowers seem to blanket the entire yard and at how the morning sunlight backlights the blue petals until they almost glow. 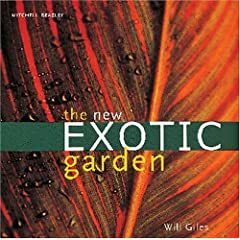 I finally got all of my major plants in the ground in my back landscape bed and my spring bulbs have also popped up, so it's time for mulch. 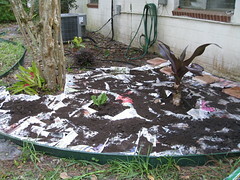 Mulch is important in the Florida garden because it helps conserve moisture and keep weeds to a minimum. I decided to lay a thick layer of newspaper underneath the mulch for extra help supressing weeds. The brown stuff you see on the newspaper is composted cow manure, as suggested by The Wicked Gardener -- it helps make the newspaper less noticeable if it peeks through the mulch, and it adds nutrients for the plants to use. I'll post a photo once I get the rest of the bed mulched (I ran out of time and supplies).